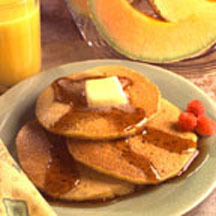 CooksRecipes has quality, kitchen-tested recipes for a variety of corn and cornmeal pancakes that you can count on for successful deliciousness. Liven up your breakfast or brunch with these hearty, cinnamon-scented cornmeal pancakes. 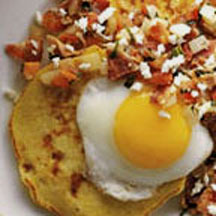 For a hearty breakfast, try these corn cakes topped with a fried egg and a delicious tomato, bacon and cheese salsa. 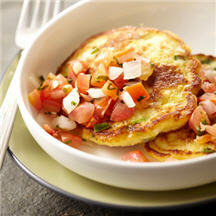 Serve these savory corn cakes with a garnish of your favorite salsa.